The fully reversible Helix Long Sleeve Shirt strikes the perfect balance of warmth, style and comfort. The design features a solid-print, 100% recycled polyester shell on one side, and super-soft merino plaid flannel on the other for multi-outfit efficiency during long stints away from home. Inside, Icebreaker used their innovative 70gm MerinoLOFT™ insulation, a sustainable and high-lofting alternative to synthetic fills made from all-natural merino wool (up to 10% of which is recycled). MerinoLOFT™ retains warmth when wet and naturally helps regulate body temperature to keep you comfortable, whether you’re sipping you’re morning coffee on the deck or road-tripping with friends. Snap-buttons on the front placket and cuffs make for easy on-and-off. Perfect for cool mornings in the woods, breezy afternoons on the coast or any time when a flannel isn’t enough and a jacket’s too much. 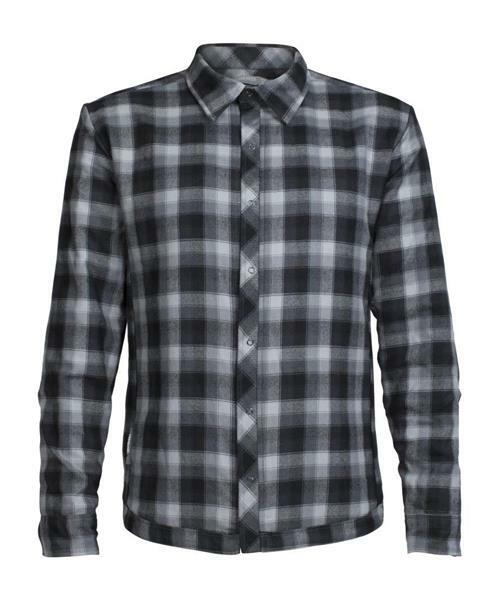 Helix LS Shirt - Mens is rated 4.2 out of 5 by 15. Rated 4 out of 5 by MadSailor from Classic look and very versatile I love this shirt for the fact that it has that classic plaid design, and the quilted look which makes it great for chilly days. The snap buttons are of great quality and really hold well. I have taken this garment on multiple camping trips already and i am surprised with how it has stood up. I thought that there would be a little more will loft in the quilted area to make it a little warmer so it feels thinner than I expected. I wpuld have also loved more colour options for the plaid side. It's stood up to a Canadian fall pretty well. Let's see how it fairs in the upcoming winter months. Rated 4 out of 5 by Rockfordeh from Hip new Product I love the rugged good looks of my new Helix Shirt. Warm Fall Shirt great for throwing on and taking the dog out or out to the store. its a show stopper. I originally just wanted this in black but the Conifer really is a a rich strong colour. the snap buttons and the reversibility is great. I am always reaching for pockets on it and I do wish it was tapered. But it is so unique and hip so these are non issues for me great product. Rated 3 out of 5 by longarm from another shirt I have a number of icebreaker hoodies and shirts and this is my least favourite . I am not fond of the reversible aspect, makes the buttons hard to use and the collar doesn't hold it's shape so I find I am always messing with it whenever I put the shirt on. Bought this with out trying it on, so my bad, someone else might really like it, just not really for me. Rated 5 out of 5 by Acorrn from Gift - was a hit I bought this as a gift for my dad who usually wears an XXL. I took a gamble on an XL and it fits him perfectly. He loved it so much he took it camping the next day even though the weather forecast was 27 degrees celsius. It feels very warm - I expect it will last him well into the fall here in the Toronto area. Rated 5 out of 5 by GSGE from Excellent christmas gift Love it. Fits wonderfully and keep me warm. Very elegant on one side and casual on the flip side. Rated 3 out of 5 by ABhiker from The Mandarin shirt I used the Fit Finder size guide and it pointed me to a Medium. Bought a Large hoping for a longer sleeve length. Found the sleeve length to be minimally acceptable. Should be 1 - 2 cm longer. Also, could use about 10% more fill. A premium priced shirt. Otherwise, comfortable. Rated 2 out of 5 by BushWhacker from Nice jacket, fits way too big Read the reviews of it being oversized but decided to gamble anyways. I lost. Great jacket but fits extremely large. Funny because I fit into a small in other helix jackets. Rated 5 out of 5 by BCMtnBiker from Out in the mountains or out on the town This is my new favourite piece of clothing. I have worn it every single day since it arrived a couple weeks ago. It's warm enough to wear as a jacket, but it's not a jacket. Or is it? It looks great and it's super comfortable. The outer is water repellent enough to wear it when there's a light drizzle, which is most of the winter on Vancouver Island.